Frank van Hemert was born in 1956 in Kerkrade-NL and studied at the TeHaTex in Tilburg and visited the studios of 63 in Haarlem. In the early 80s he was discovered as a young talent and received by Rudi Fuchs invited to Documenta 7 in Kassel. His works are in numerous museums such as the Singer Museum in Laren, Gustav Lübcke Museum in Hamm, Siegerlandmuseum in Siegen, Teylers Museum in Haarlem, Bommel van Dam Museum in Venlo, Haags Gemeentemuseum in The Hague, the Stedelijk Museum in Amsterdam or the Bonnefantenmuseum in Maastricht. In addition, his works are included in a number private and public collections and has been in exhibitions: shown in Boston, Hong Kong or London. The versatility of his work, both on canvas and on paper, speaks of many comprehensive series on the big issues of life such as death, suffering and isolation, love, eroticism, and the question of how and why their own identity. 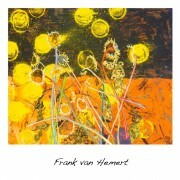 Frank van Hemert profits from the non-representational and figurative expression. In some images, the figurative allusions are so strong that the balance between characters and basic threat break. About capturing the radiance of his characters, he looks for a physically tangible force that he seeks to emphasize by painterly means.